JHipster is able to generate Kubernetes deployment descriptors for the applications it generates. It recently started offering to add Istio specific configuration in these descriptors. After a brief introduction to Istio, the currently most known ServiceMesh, we will see that the microservice architectures associated with these deployments can be very different depending on the generation options chosen, and we will study their associated characteristics. Istio is a ServiceMesh completely integrated with Kubernetes. Without going into too many details, which is not the purpose of this post, its role is to manage all the communications between the services within your microservice architecture. We'll talk a little more about how it works later in this post. registers itself (with its default IP) with Eureka. This architecture works well on a "vanilla" Kubernetes cluster ("without Istio"): the JHipster generators ensuring the Kubernetes descriptor contains the necessary configuration for deploying the JHipster Registry in high availability (several replicas being created via a StatefulSet). The operating principle of Istio is based on the injection of a proxy (this proxy is Envoy) within each Pod. (Consequently: every Pod will host an instance of a given microservice and its co-located Envoy proxy). All incoming and outgoing network connections on each Pod are routed through that proxy (via iptable rules) which is then able to apply calling and routing policies independently of the hosted microservice. This proxy handles the routing of each call to the instances of the right microservice. This routing can be done according to various criteria, most of the time via a mapping of the host of the URL to a particular service type (but the path of the URL or even the HTTP headers can also be used). For example, within a Kubernetes cluster in which an Istio VirtualService named "productservice" would have been defined and associated with a Product microservice: the Cart microservice (using the samples of the schemas of this post) only needs to call a URL of the type: http://productservice/catalogs/112 and rely on Istio to route this call to an available instance of the Product service (by handling itself aspects such as: timeout, circuit breaking and retry). The generated Kubernetes descriptor sets appropriate environment variables to disable IP registration in Eureka and replace it with registration by name. For Eureka, this name is considered to be the hostname of the machine hosting the service. Here it will be filled with the name of the Istio VirtualService associated with the microservice being deployed ("productservice" in my example). Envoy proxies have been represented in green on outgoing calls (but they also capture incoming calls). The Istio gateway has also been represented on the Ingress (whose role is to route external calls to the cluster to the right services). 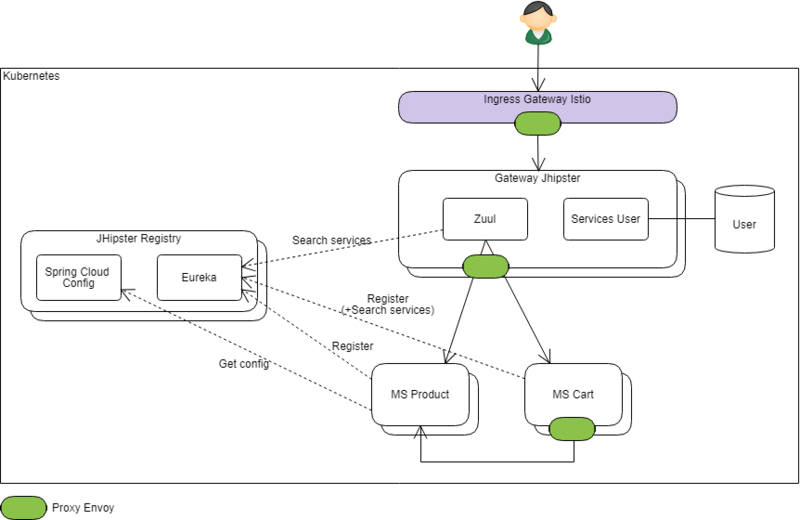 Please note that here each instance of a given microservice registers itself with Eureka with the same hostname ("productservice" in my example above for the MS Product). If there are 2 replicas, Ribbon will have the choice between two instances: "http://productservice/" and "http://productservice/"... It's pretty obvious here that it will not really play its loadbalancer role since in the end, it will be the Envoy proxy that will decide to route "http://productservice/" to either replica of the Product microservice. The use of a simple HTTP client will have the same overall effect (taking into account the additionnal remarks below). it is desirable to activate only one of the two mechanisms for more control (by default JHipster does not activate Ribbon's retry mechanism, but Istio's retry mechanism is activated in the generated descriptors). and you have to configure them in a consistent way: you probably don't want the Hystrix timeout to be triggered before the Istio timeout (or during the retry configured in Istio). The previous configuration has the merit of allowing to execute the application without major changes, but it does not completely embrace the mechanisms of Istio and their advantages on the simplification of the application code (and its configuration). Ray Tsang (@saturnism) of Google, who is the initiator of the work on Istio in JHipster, has meanwhile tried to ensure to generate an architecture more adapted to Istio. 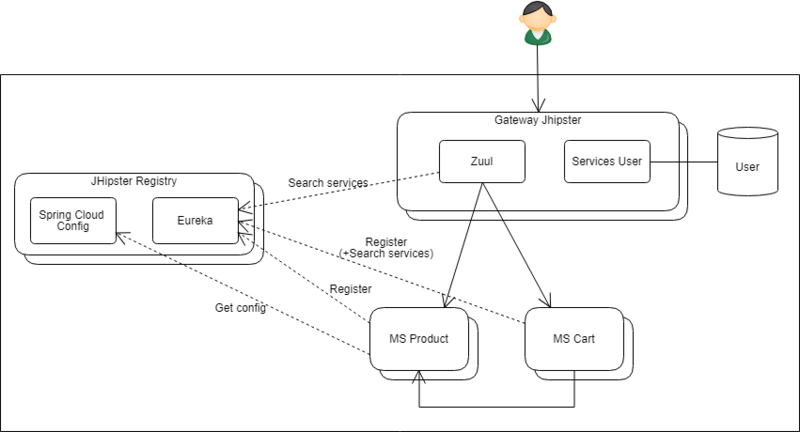 Zuul configurations and Eureka clients are no longer generated in the Jhipster gateway and microservices. with the main effect that the JHispter Gateway can no longer forward any call to microservices. the "JHipster Gateway" takes the same place as any of the other services and only hosts the web application and core services such as the user repository. 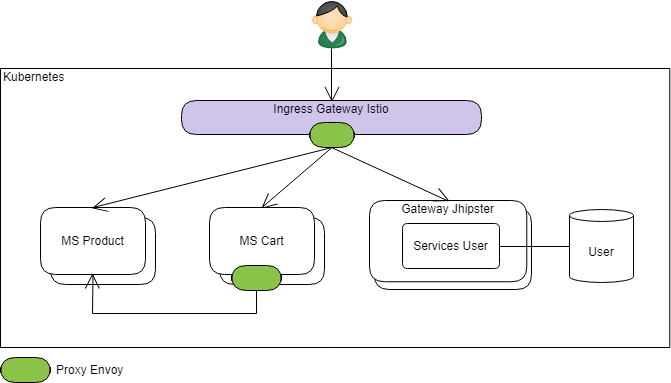 Deepu K Sasidharan (@deepu105), one of the main contributor of JHipster, has also illustrated the architectural impact of the use of Istio in this article: JHipster microserviceswith Istio service mesh on Kubernetes. Here, no more Netflix stack: external calls are routed directly to the right service (while benefiting from the circuit breaking and retry) from the ingress and inter-service calls need a HTTP client to be performed (again benefiting from Istio services). To be more precise, we can of course keep Feign (originally created by Netflix) to make these calls, but Hystrix, Ribbon and Eureka are no longer necessary in the general case (in some cases, Hystrix can still provide some services). The interested reader can read this comparison between Envoy and Hystrix from Christian Posta (@christianposta). removal of the Service Discovery function has completely erased the JHipster Registry from the landscape, and Spring Cloud Config with it. 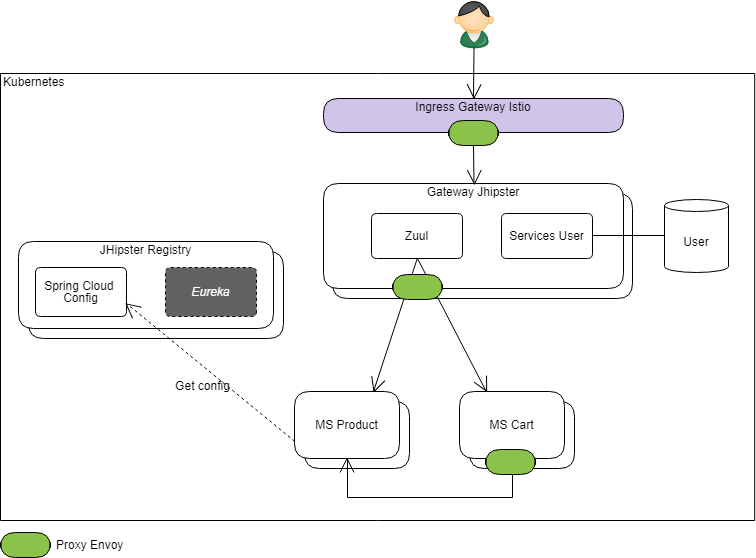 The JHipster gateway as an application gateway has several roles to play in a microservice architecture: the routing of calls to the microservices is only one of these roles. Note: the "JWT" authentication mode generated by JHipster works well here but the other modes (including UAA, which is also good because it remains stateless) will need the gateway. The integration of a more powerful JWT authentication (with refresh in particular) will also often need a gateway. Different strategies can be used to handle all of these aspects, but an application gateway is still the easiest way to host them centrally. Depending on the needs, the two points above can be acceptable but I propose below an architecture that is coherent with Istio while still preserving the additional features of the classic JHipster architecture. Disclaimer: as of today, JHipster does not know (yet?) how to generate this architecture directly. It can be seen below that this would probably involve making specific changes to the generated code of the gateway that would only make sense for this particular case. The goal here is to put the JHipster gateway in front of the microservices and possibly to keep Spring Cloud Config in the landscape. at the Istio level, a "VirtualService" named "servicerouter" will have been defined. According to the contextPath (here "/product" or "/cart"), it will be able to route the calls to an instance of Product Microservice (or respectively of the Cart microservice). However, the standard Zuul routing filter must be reimplemented/reconfigured in order to meet the strategy described above. Of course, if the filters in question are not necessary, Zuul can be simply deleted, and replaced with a simple proxy component that merely delegates HTTP calls to URLs of the form http://servicerouter/xxxx. The microservice architecture of JHipster is based on Spring Cloud and in particular on the Netflix stack (although alternatives such as Consul and Traefik are also available), and that totally makes sense. It is therefore perfectly normal that this architecture applied as is on Istio shows some limitations. As I described at the end of this post, I think that the essence of this architecture can remain valid even hosted on Istio. However, this would require modifying the generated code on the JHipster gateway to explicitly handle this particular case. It's difficult to make everyone happy, JHipster already offers a very rich generation combination and therefore is complex to maintain. So in its current state, the interested reader will have to implement himself the strategy described above. Last but not least, version 1.0 of Istio was released at the end of July 2018. It is a very promising technology but remains young and little known. Spring Cloud, especially in a context where it is well understood, still responds very well to most issues.